Dave Sims was born in Gloucester on 22/11/1969 and is the Grandson of former Cheltenham prop Thomas William Price, who gained 6 England caps between 1948-49. He played his early rugby for Longlevens RFC and enjoyed a spell with the Sunnybank Rugby Union Club in Brisbane, Australia. Sims played for Gloucester Rugby Club Colts before playing his first game for Gloucester United during the 1987-88 season. His rapid rise through the Gloucester ranks was complete the following season when he started on the bench for the first XV against Ebbw Vale on 12/10/1988, eventually making his first senior start against Cheltenham the following month. He started on the bench for the Pilkington Cup final defeat to Bath at Twickenham at the end of the 1989-90 season, before becoming a regular in the first XV pack during the 1990-91 season. Sims went on to have an illustrious career for his home town club, providing them with 12 years of sterling service as an uncompromising second row forward, having also played at number 8 during the early part of his career at the club. 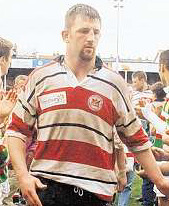 Sims was elected Gloucester first XV captain by his fellow players for the 1995-96 season guiding the team to the semi final of the Pilkington Cup where they lost to Bath and 8th place in Courage League One. Before rugby turned professional in England at the end of the 1995-96 season he combined playing with his career as a tyre salesman, becoming Gloucester’s first full time professional in May 1996 when he signed a 2 year contract. He was elected as club captain again for the 1996-97 season, accepting the added responsibility of helping to guide Gloucester though the gradual transition from amateur to professional club. This proved to be a tough time for Gloucester on the pitch, but Sims demonstrated his excellent leadership skills once again leading the club to the semi final of the Pilkington Cup where they lost 26-13 to Leicester and 7th place in the league, before standing down as club captain at the end of the season. A prime example of Sims commitment to Gloucester during this period occurred when his wife Jill gave birth to their first child, Nat Sims, on 05/04/1997 only 50 minutes before a league match against Saracens. He rushed from the maternity ward to take his place in the starting line up with seconds to spare, a game which Gloucester went on to win 9-6 at Kingsholm. During the 1997-98 season Sims was a key figure in Gloucester’s Cheltenham & Gloucester Cup triumph, starting in the 33-25 final win against Bedford at Franklin’s Gardens. This was an especially important victory for Gloucester as it was the clubs first cup win since 1982 when they shared the John Player Cup with Moseley following a 12-12 draw after extra time in the final at Twickenham, and the clubs first piece of silverware since winning the National Merit A Table in 1985-86. He became club captain once again for the 1998-99 season, but after Richard Hill was sacked as coach in February 1999 following a string of bad results, Philippe Saint-Andre replaced him as player coach dropping Sims to the bench. Despite this setback he helped guide the club to the semi final of the Tetley’s Bitter Cup where they lost to Wasps and 10th in the Allied Dunbar Premiership. Gloucester also managed to retain the Cheltenham & Gloucester cup, once again beating Bedford in the final at Franklin’s Gardens with Sims returning to the starting line up to captain the side to glory. This proved to be a last hurrah for one of Gloucester’s finest servants as Saint-Andre placed him on the transfer list at the end of the season as part of cost cutting measure. After interest from a number of clubs he signed to play for Worcester in the Allied Dunbar Premiership Division 2 for the 1999-2000 season. In January 2000 Sims moved back into the top flight on loan to Bedford for the remainder of the season. He returned to Worcester and was named the clubs 2000-2001 player of the season. Whilst playing for Worcester the following season he was selected to play for a National Divisions side against South Africa at Sixways. He was then named captain for their next game against Australia at Welford Road, which they lost 34-22. Sims then left Worcester to join their National Division One rivals Exeter for the 2002-2003 season, after being talked out of retirement by Exeter director of rugby Ian Bremner. Since leaving Exeter Sims has shown his love for the game by dropping down the rugby ladder to play for Launceston RFC, Taunton RFC as player coach and Wellington RFC rugby club as player coach. Currently (2014) he is head-coach for Withycombe RFC senior squads and playing lock for the 1st XV, where they are enjoying a great deal of success topping the Tribute Devon and Cornwall league. During his playing career he also made prestigious appearances for the Penguins RFC and Major Stanley’s XV invitational sides. Sims was first selected to play for the South West Division during the 1989-90 season as a number 8, representing them 12 times throughout his career, both against touring international teams and in the divisional championship. He was also selected to represent Gloucestershire on a number of occasions, captaining them to the county championship title in 2002 after beating Cheshire 26-23 in the Twickenham final. He was captain again for the county’s 2002-2003 campaign, leading Gloucestershire out against Surrey at Kingsholm on 03/05/2003, the first time they had played at the ground since 1984. Unfortunately Sims missed the 2003 final defeat to Lancashire as he was recovering from an operation. Sims represented England at Under 21, B, A and senior level. He was first selected to play for England Under 21’s against their Irish counterparts on 29/10/1990 at Moseley. During the 1991-92 season he was selected to train with the England Development Squad before touring New Zealand with England B at the end of the season. The next step for Sims was selection to tour Australia and Fiji with England A at the end of the 1994-95 season. In 1996 he was picked to tour Australia with England A again but had to miss the trip with an achilles tendon injury that required surgery. During the 1996 5 nations he was called into the full squad for the game against Scotland at Murrayfield but didn’t play. He was selected in the England training squad at the start of the 1996-97 season by the then England head coach Jack Rowell, but didn’t make the final squad and went onto play for England A again. Not long after this Clive Woodward became head coach and Sims was selected to play for an English Rugby Partnership XV against New Zealand at Ashton Gate in November 97, retaining his place in the A squad as a result of his display.